New! Relive the thrill of cheering on Spike and Alice with our creative line of richly scented candles. A great gift for Mother’s Day, anniversaries, birthdays, and all the special people in your life. Very Titan Berry gives new meaning to “fruit flavored.” It is very, very, very berry. Note, the scent may be too sophisticated for small children and pets. Eau de Titan Arum is spicy and surprisingly energizing. Recalls the electrifying moment when the titan arum blooms! Deeply organic and powerful enough to scent the whole house. Skunk Cabbage No 5 is a mysterious and musky scent. Guarantees that guests will flock to your candle like flies. Can you order online? Of corpse! titan arum (Amorphophallus titanum) inspired scents. We recently toured the Greenhouses with Boyce Tankersley, director of living plant documentation, to see what’s in bloom and take in the different climates visitors can enjoy. In the Arid Greenhouse, we saw a number of species of aloe from South Africa just coming into bloom as well as cacti and succulents. In the Tropical Greenhouse, we were surrounded by palms and cycads while we admired the many orchids in bloom. Tankersley pointed out the acanthus cultivar (Aphelandra sinclairiana ‘Panama Queen’) native to Panama and Costa Rica, as one of his favorites. The Semitropical Greenhouse was filled with blooms like pinkball dombeya (Dombeya wallichii). Native to East Africa and Madagascar, the genus is a highly sought-after ornamental in USDA Zones 9 and warmer. One of the rarest plants in our collections is Deppea splendens. Native to the mountains of western Mexico, this plant is extinct in the wild. Visit our What’s in Bloom highlight page each week — twice a week during the summer bloom season — to learn more about the different plants in bloom. 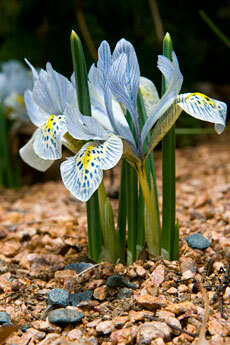 Then, come out to see them in person for their fragrance and the humidity of the warmer greenhouse climates. Boyce Tankersley, Director of Living Plant Documentation, takes us on a tour of what’s blooming in the display gardens on the first day of fall. Sweeps of perennials on Evening Island, the cascading mums on the Visitor Center bridge, and masses of mums in the Crescent Garden, are found in the boundaries of our formal garden areas. Our show doesn’t end there, however — find gorgeous asters and sunflowers in the English Walled Garden, Japanese anemones and Endless Summer hydrangeas in the Waterfall Garden, mums mixed with later blooming annuals like zinnias and rudbeckia in the Sensory Garden, and an amazing array of colorful annuals in the Circle Garden. We only visited six of the 25 display gardens, so come out to see them all this fall! Visit chicagobotanic.org/inbloom/ for more information on what’s in bloom. We stopped by the Production Greenhouses to see what they are growing for the upcoming spring garden displays. Tim Pollak, Outdoor Floriculturist, said we are growing 66,000 spring annuals and vegetables onsite this year for displays in the ground, in hanging baskets and containers. Tim explained that the foxgloves you will see in the Circle Garden and Rose Garden were started from seed in October, grown at 42 degrees F for six weeks and brought into the greenhouse in January to grow with long days and warm temperatures to get them to bloom earlier than usual. The lupines you will see in the Heritage Garden and English Walled Garden are two years old and we plan to return them to the greenhouse for many years so they will continue to grow in size. The penstemon you will see in the Circle Garden have been growing for one year to get them to size, then overwintered in a nursery quonset and brought into the greenhouse in January to grow with long days and warm temps to get them to set flowers. Now, they are back in a quonset to slow their flowering until they are planted outside. We are growing several species of echium (tower of jewels) for displays outside the Visitor Center as well as in the Heritage Garden and English Walled Garden. Most of the plants shown here were started from seed 18 months ago to get them to flower this spring. Echium fastuosum will grow 5-6 feet tall outside the Visitor Center, whereas Echium pininana will grow 12-14 feet tall in the Heritage Garden. What are you most looking forward to seeing this spring?